Guys, my kitchen is gone. In its place, bits of plaster, layers of missing drywall and cords hanging out from everywhere. I made my coffee this morning using water from the hose heated in the microwave. 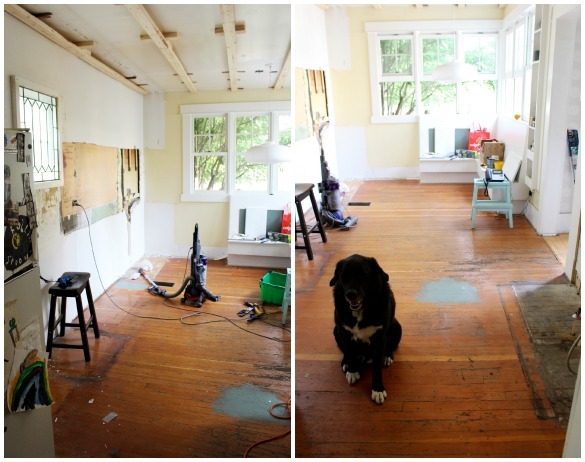 People have been asking how my renovations are going – and is my kitchen finished yet? – since I mentioned it back in March. And now it’s mid July and how it’s going is slow, and I imagine all those (very kind, thoughtful, well-meaning) people who are asking how my new kitchen is have never actually undergone a kitchen reno themselves. After kicking it down the road for a month or three, I had the bright idea when I left for Italy in June to leave Mike with instructions to tear out the majority of the kitchen (leaving the oven, fridge and sink intact), rationalizing that if the kitchen was torn out, we’d have to replace it. Right? Sort of the throw-your-hat-over-the-fence train of thought. That’s what grown-ups do, right? 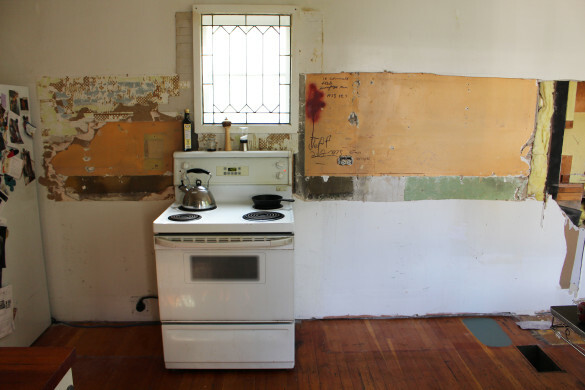 The thing is, my kitchen wasn’t really that bad, in a pieced-together ramshackle kind of way. But the oven, an old GE electric that was old and well-used before we moved in 8 years ago and has helped me write a few cookbooks and hundreds (thousands?) of stories and posts and projects since, is getting ready to go. I need an upgrade. I need something bigger. Which means I need a hood fan (I knew I wanted a gas stovetop, at least), which means tearing out the overhead cabinets and cutting into the countertops, which being narrower than standard and not an optimal material (they used to be in the U of C science lab) could stand to be replaced too. And those lower cabinets – it’s so hard to get things out from the back on the lower shelves! So really, it was a domino effect in all directions. The problem is, I hear nothing but horror stories when it comes to the subject of renovations. 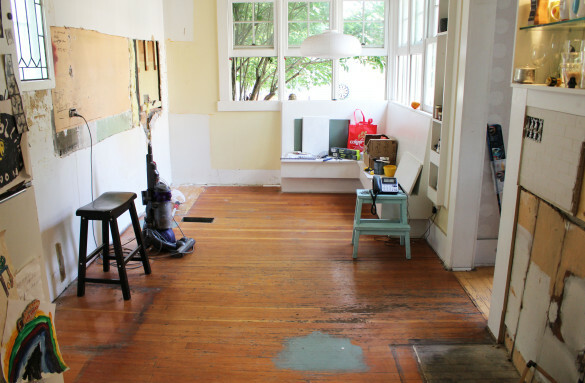 No one says, “we did a full kitchen reno and it went so smoothly! 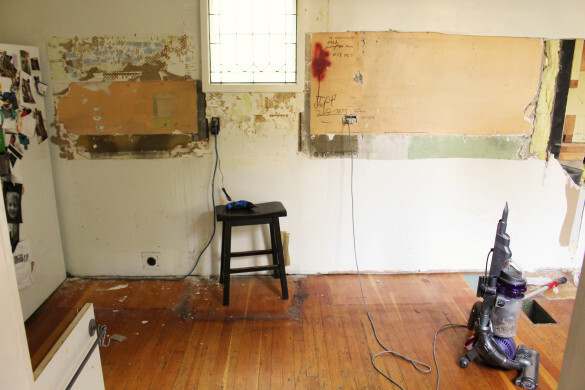 It was done in half the time we expected, and under budget!” When I mention our little project people reply with shudders over the time they spent a year kitchenless, or tore out a wall to find a $25k repair job lurking underneath. My sister’s small bathroom reno took a good 6 months, during which time she and her kids took turns bathing here and at the gym. With a 106 year old house, I was under no illusions that the process would be without its obstructions. So far, a new oven has necessitated decisions about not only the cupboards and countertops, but the wiring, the plumbing, the sink, the ceiling and the floor. And whether we just want to scrap it all and move. And so it begins. I’ll be posting updates more often here, starting with the stove – as much as anything as an outlet to keep myself from curling up in the fetal position under the bed until it all goes away. To use a summer adage – sink or swim, right? I am so excited for you!! SO pleased as well to see a 106-year old beauty getting shined up instead of knocked down for a total rebuild. I did a kitchen reno with a contractor and designer. Started last September, finished this past January. I love it. Also revamped a main bath and powder room, and replaced the flooring. Came in more or less on budget (okay, more). I hear stories of people doing it themselves and I just can’t imagine. Good luck! Well, Julie, I have done 3 kitchen renos and I would do it again in a heartbeat. Touch wood but I have had wonderful trades people and always more or less on schedule. And the results have always been worth the agony. I mean, did you really expect no pain? No, I didn’t think so. It is sad letting go of the past and the future is so, well, so uncertain, at times. Enjoy the journey, as they say. What beautiful windows you have in your kitchen! It’s amazing how much you can accomplish with an electric kettle, toaster oven, microwave and electric frying pan in the meantime. It will be so worth it when it’s done. I just hope you have a designer. They’re worth their weight in gold for getting things done and not allowing compromises. Good luck! Seriously, hope it goes great. Go for your dream kitchen!! A 158 year old house! wow – that’s so cool! Unfortunately hiring a designer isn’t in our budget (ditto the contractor – we’re doing it ourselves!) but my mom has a great eye for these things.. she’s designed a few houses herself, consulted on many, done the interior of a store and a salon.. she knows the lingo, what to ask for, what we need. She’s in our back pocket! As for the fixtures and paint and stuff, it would be nice to have a second opinion, but I don’t like a lot of what designers put together either – it’s tough to know if you’re going to find one with the same taste! I think the only thing worse than living in a house undergoing a kitchen reno might be trying to do one while pregnant. But my experience matches everyone else’s: it’s worth it in the end! We did a main floor Reno in a 45 year old house including kitchen, dining room and living room. It involved tearing out walls, moving doors and installing a two sided gas fireplace that is visible in all three rooms. Our contractor was fantastic…not over priced and wanted us to have the house of our dreams. He got everything done in eight weeks, and on budget! We designed ourselves and love every inch? Good luck Julie, well worth the effort! Perhaps an ‘off the wall’ suggestion – that interesting find on the drywall…. have you considered cutting that out and saving it as a decoration for your new kitchen (framing it)? It’s hard to tell from your picture if it’s worth keeping…. Yeah, Andrea C: too true. And really, doing a reno IS like being pregnant. You’re more than slightly uncomfortable. You’re totally committed: no turning back now. You keep hearing stories of other folks’ terrible/ easy/ perfect renos. and often those stories are helpful, and sometimes they aren’t. And then when you’re finally done? wow. So totally worth it. Keep us posted. I love seeing how a real reno happens: not backed by (seemingly) infinite resources, and it’s not done in a half hour. Tough decisions, and all the reasons for them. And the care that goes into a reno you do yourself! Hey Julie, your kitchen is going to be wonderful! From the time you get the ideas in place to the final bits done, it really does take some time. I have a kitchen with about the same sq footage as yours and had a Kool-Aid budget. Took several months (over Christmas too) but the end result couldn’t be better. Hang in there, the space is going to be great and you, Mike and W will love it! Hang in there and enjoy the journey. It won’t take long for you to forget all the angst and enjoy your new digs. It will all be worth it! Hopefully you do not have asbestos. Ha! We basically just scrapped it all and moved over a bathroom reno. I have to say, though, the new house has a gas range and great island in a huge kitchen and is already so worth the stress and hassle. I’m sure yours will be, too, once it’s finally done. I expect you’ve cooked in enough different kitchens over the years to have a good idea what works best for your family. Ooooooooh! Big changes Julie!! I’m sure things will go just fine. Sure, there’ll be bumps but you’re living my dream right now. SO I’m excited for you. As a renter, I don’t really get to remodel a kitchen. But when I do – eventually…. I’m starting with the stove. I need (and by need, I mean want desperately) one of those 2 door/temperature ones. Amazing. We had a few setbacks and went over our budget (by about 15%) but it’s much better than before and EXACTLY what I wanted. For the kitchen design, go to IKEA. Even if you do not plan to buy an IKEA kitchen (although, if you get it on sale, you can get a pretty nice kitchen for cheap; the quality is good, guaranteed for 10 years; and 5 years ago, it was the only non-custom kitchen made with low/no VOC particle board.) There are people who can help you figure things out. There’s even a design programme on their website if you don’t want to go to the store. You need the outline of the kitchen, exact measures of the walls, door placement, etc… and perhaps a wish list. The kitchen designer can help with the rest. In fact, I think Home Depot and other big box hardware stores have kitchen consultants on site as well. As for the stove, if you are gung-ho about going gas, go gas. However, if you have to stick to electric, DO NOT make the mistake of getting a ceramic-top cooker: they may be easier to clean, but they are virtually worthless for cooking. NOT enough heat, stick to those old school coils. Here in the UK, coil burners are no longer available, and most new kitchens are fitted with ceramic top electric: it’s impossible to stir-fry on these, and forget about getting a proper sear on meat! Good luck with the reno! Good luck to you in coping with all of this. If I lived nearby I’d invite you over for dinner every day til it’s done. Maybe even beyond that.. I might be too late, but a close up photo of the drywall phone numbers would make hilarious framed art for your new kitchen! Julie, hard to imagine that a kitchen with so much history and character could ever turn out wrong! My mom decided at the very last minute to do a full on kitchen reno just a month before my wedding, and guess what? It somehow got (almost completely) done on time, pretty darn close to budget and no one even noticed that there was no backsplash 😉 Good luck with your reno – it will be so worth it!! You guys! Thanks for all the stories, advice and words of encouragement. Glad to know all of you have gone through the same!